Ho Hyun Nahm returns to the publishing scene with the release of “Designing Your Own Unique and Dazzling Life” (published by AuthorHouse UK), a book chronicling his experience as a patent attorney and intellectual property specialist and as a creative minority. His is a story of sacrifice and success, challenges and lessons. From his experience, Nahm asserts that the “power of positive force,” “creative mind” and “best efforts” can bring unbelievable results. In the first part of his book, he shares personal confessions on the topic of creative best efforts from the perspective of a person working as a patent attorney. He then details the behind-the-scenes story of how an established Supreme Court case is reversed and a new precedent is adopted and relied upon by exerting his unique “creative best effort.” Nahm also added the applicable court decisions to give better context. 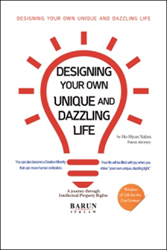 A unique mix of biography and legal theory book, “Designing Your Own Unique and Dazzling Life” highlights Nahm’s exciting real stories that offer inspiration, encouragement and wisdom of life to readers. You must live with creative best effort. Your life will be filled with joy when you can shine “your own unique, dazzling light.” I am certain that your own “light” will contribute to the mankind in its own way. Ho Hyun Nahm is an internationally respected and recognized patent attorney and leading authority in the practice of international intellectual property law. Born in Yeongdong Chungbuk Province, Korea, in 1953, he obtained his bachelor’s degree in law from College of Law at Choungju University in 1976 and master's degree in public administration from the Graduate School of Public Administration at Seoul National University in 1985. He served as a partner at Central International Law Firm from 1987 to 1996. He founded his firm, H.H. Nahm International Patent & Law Firm, in September 1996. As of July in 2006, he established a strategic co-alliance partnership with Barun Law, a major firm in Korea and changed the name of firm to BARUN IP & LAW. In addition to his national and international positions and multiple accolades, Nahm hosted a weekly TV show and appeared in broadcasting frequently; spoke at international occasions; wrote a great number of articles and books, some of them recorded best-seller.